'Satan has Jaws!' Every year we get some crazy new viral sensation in the way of a B Movie trailer, and they usually involve sharks. This summer is no different, as WildEye Releasing gets ready to unleash the most unbelievable Great White tale yet! There's been a Sharknado! We've seen a Ghost Shark! But nothing will ever be able to prepare us for the horrors of the Shark Exorcist! 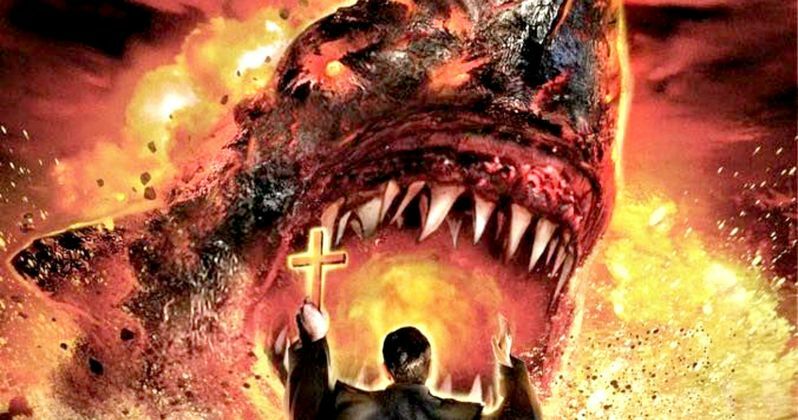 In Shark Exorcist, a demonic, murderous nun unleashes terror on a small fishing town when she summons satan to inhabit the body of a great white shark. Wait, there's more! Satan then possesses the body of a local young woman, starting a chain reaction of evil. Now a Catholic priest must take to land and sea in order to send this man-killer back to hell! Cult director Donald Farmer, who is known for such gems as Country Strong and Blood Feast 2: All U Can Eat, is the man behind this madness. The first trailer for Shark Exorcist teases the gruesome bloodshed and cheap production values we can expect. We also have the poster and a whole bunch of photos for your pleasure. Just don't get carried away. Mama's all out of windex! Shark movies have become big business on the home and VOD market in recent years. Sharknado helped usher in a new wave of wacky titles, becoming its own cottage industry when it debuted in 2013. There have already been two subsequent sequels, with Sharknado 2: The Second One arriving just a year later, and Sharknado 3: Oh Hell No! premiering to raves and jeers alike this past summer. Sharknado 4 is on the way later this year, but we're not sure when we'll see the first trailer for that sequel. It can't possibly live up to the dangers and thrills of Shark Exorcist, though, which pushes the Sharksplotation genre to all-new heights. Hollywood hasn't been ignoring this trend. Warner Bros. is in pre-production on the long gestating Meg sequel, which just lost director Eli Roth but replaced him with Jon Turteltaub. While we await that big budget blockbuster, we'll have to wade through the shores of this epic shlock masterpiece, which is sure to be come a cult hit. Ladies and gentlemen, batten down the hatches and prepare yourselves for the one, the only Shark Exorcist!